Love your book, "8 Characteristics of The Awesome Adjuster". I bought a copy of it some 10 years ago and it is still a valuable resource. For the past several years I have been mentoring adjusters in our company who are looking to move up to larger and complicated losses. The first thing I have these adjusters do is read your book. - Darrell Portz, Executive General Adjuster at ClaimsPro Inc.
No one, before Carl Van, was able to bring such meaningful information to our employees in such a direct way, using Real Life examples. The lively style, quick wit and humorous stories and examples were right on point and just what our company needed. 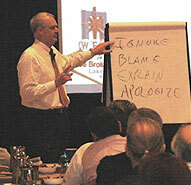 We have had literally hundreds of guest speakers in the past, all top quality. But Carl Van's performance was without a doubt the most poignant, thought provoking and entertaining session we have ever had. Carl Van brings a unique and refreshing style to his very dynamic presentations. He is able to relate his high level theories to all levels of employees within the organization. The information he provides is interesting, helpful, and useful right away. I learned so much that I can put into practice immediately. Now, it's back to business-I have to update my "working To Do List"!! I attended one of your seminars recently at a State Farm office in Brookfield, Wisconsin. Great Presentation! I hope to convince my boss we can't afford not to expose all of our Fire claim people to your presentation. Thanks for the 8 Characteristics book. Its really on point and maybe the best "read" a new or experienced claim rep could ever take advantage of. Carl Van's training style is very engaging. Making it interesting and fun always improves my opinion of the training. Thank you for bringing in such a fantastic speaker! I had a chance to speak with each of my Examiners and they were very excited about their time with Carl Van.